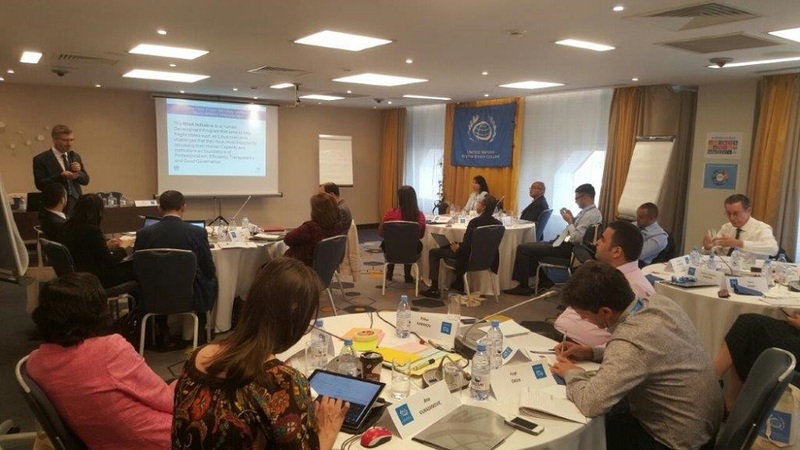 SESRIC in collaboration with United Nation Office for South-South Cooperation, the Islamic Development Bank and United Nations System Staff College organized a capacity building training on the South-South & Triangular Cooperation (SS & TC) on the sidelines of the “Astana Economic Forum” which was held in Astana, Kazakhstan on 12-14 June 2017. The purpose of the training programme was to provide the participants with a common understanding of the theory and practice to help promote the South-South and Triangular Cooperation in their respective countries in the context of the 2030 Agenda for Sustainable Development. H.E. Amb. Musa Kulaklıkaya, Director General of SESRIC, and Mr. Mehmet Fatih Serenli, Director of Technical and Cooperation Department of SESRIC, both made presentations during the training programme. Their presentations delved on the role of SESRIC in supporting of South-South Cooperation in the context of the Agenda 2030 and SESRIC’s facilitation of Networking and Skill Development in Support of South-South Cooperation. They also highlighted the most recent tools and methods in the area of SS & TC in advancing the national development priorities and implementation of the Agenda 2030 in OIC member countries.